What are the dynamics of a small town? What is nurturing and supportive about a small town? What is intrusive and destructive? Do people have an absolute right to privacy? When should privacy take a back seat to “public good”? Why do people keep journals? Why does Samantha keep a journal? What function does journal writing perform in her life? Is Samantha in crisis? At what point have we encountered her in her life? Have you ever kept a journal? What did it do for you? Is Chris careful or foolhardy? Does she place her job or her personal life first? Was her trip to the Clarke house impetuous or well calculated? Should a journalist do almost anything to get at the truth? Why is Jack so angry? What in his background might have happened to Jack to cause his emotionally abusive behavior toward the people in his life? Would you agree Jack is a “head” person rather than a “heart” person? What makes an artist essentially different from other people? As an artist, what are Miranda’s priorities? Do you believe Miranda “makes” things happen with her paintings? Why do some women manipulate every personal and business relationship? What are Zelda’s motives? What’s her history? Why is Cynthia so calculating at such a young age? What is Zack’s attraction to Cynthia? What is his ambivalence toward her? What attracts him about Miranda? How does a person tell whether or not they’ve met the “right” person? Is Miranda responding to a deep and soulful recognition when she meets Zack? Is she wise in pursuing a relationship with him, or is she treading on dangerous ground? 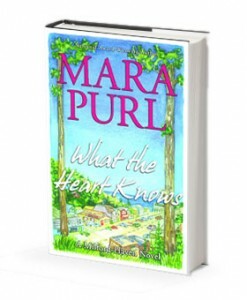 As a former journalist who wrote for the Associated Press, The Financial Times of London, Rolling Stone, the Christian Science Monitor, and the Mainichi Daily News, Mara Purl was trained to do extensive research and to report accurately. How might her journalistic background have influenced her as a novelist? What does YOUR heart know? Does important information come to you through both head and heart? What do you do with “heart” information – ignore it, or pay attention to it? As the title for the first of a series of twelve books, is it possible this is a theme for Milford-Haven itself, and everyone who’s drawn to the town?